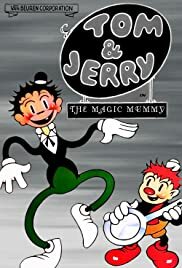 The Van Beuren Tom and Jerry (as said already not the famous cat and mouse, this is a human duo that lasted for just under 30 cartoons, 29 if memory serves correct, between 1931 and 1933) series was interesting but uneven and not easy to rate as an overall whole. At the series' best, the cartoons were good, very good in a few cases. At its worst, they were really bad. 'Magic Mummy' by far is one of the best of the series. It's one of the strangest (a good thing, the humour the series aims for is absurdist but some cartoons were far more successful than others) Tom and Jerry cartoons, with its emphasis on surrealism, but it is also one of the funniest and along with 'Wot a Night' and 'Pencil Mania' it's one of their most inventive. There is actually very little wrong in 'Magic Mummy', which is at its least good in the primitive at best way the characters are drawn (true of even most of the best cartoons) and the ending which is too easily foreseeable. Don't expect the cartoon to make sense either. However, the music is outstanding. Even in the worst Tom and Jerry cartoons it was the best asset. It is so beautifully and cleverly orchestrated and full of energy, doing so well with enhancing the action. Moreover, the gags are also among the most consistently entertaining and well-timed of Tom and Jerry's cartoons. The middle is especially good. There are some great-looking surreal images (despite the character designs, 'Magic Mummy' is nonetheless of the better looking cartoons of the series), a truly joyful atmosphere that puts a smile on one's face and it's creepy too. It is very hard not to enjoy the weirdness and inventively done surrealism and absurdity. 'Magic Mummy' is very well timed and the supporting characters are wonderfully ghoulish. Tom and Jerry are slightly bland in comparison but also fun to watch and carry the cartoon better than most of their outings.